List of nominees for the 90th annual Academy Awards presented by the Academy of Motion Picture Arts and Sciences. 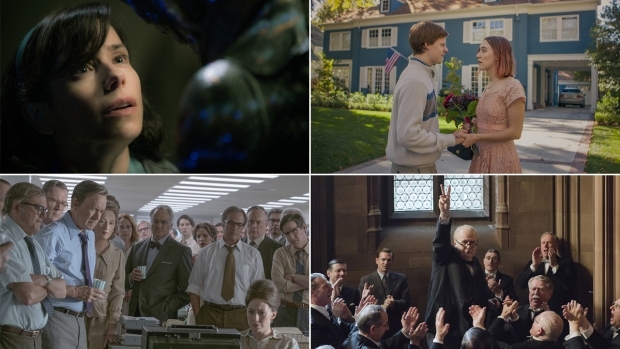 Best Picture: "Call Me by Your Name," ''Darkest Hour," ''Dunkirk," ''Get Out," ''Lady Bird," ''Phantom Thread," ''The Post," ''The Shape of Water,""Three Billboards outside Ebbing, Missouri." Actor: Timothee Chalamet, "Call Me by Your name"; Daniel Day-Lewis, "Phantom Thread"; Daniel Kaluuya, "Get Out"; Gary Oldman, "Darkest Hour"; Denzel Washington," Roman J. Israel, Esq." Actress: Sally Hawkins, "The Shape of Water"; Frances McDormand, "Three Billboards outside Ebbing, Missouri"; Margot Robbie in "I, Tonya"; Saoirse Ronan in "Lady Bird"; Meryl Streep in "The Post." Supporting Actor: Willem Dafoe, "The Florida Project"; Woody Harrelson, "Three Billboards Outside Ebbing, Missouri"; Richard Jenkins, "The Shape of Water"; Christopher Plummer, "All the Money in the World"; Sam Rockwell, "Three Billboards outside Ebbing, Missouri." 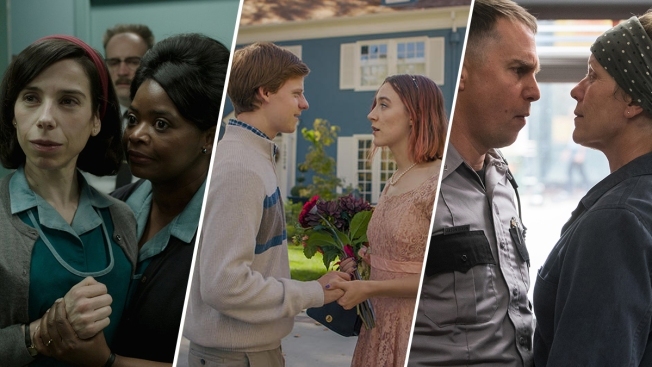 Supporting Actress: Mary J. Blige, "Mudbound"; Allison Janney,"I, Tonya"; Lesley Manville, "Phantom Thread"; Laurie Metcalf, "Lady Bird"; Octavia Spencer, "The Shape of Water." Directing: "Dunkirk," Christopher Nolan; "Get Out," Jordan Peele; "Lady Bird," Greta Gerwig; "Phantom Thread," Paul Thomas Anderson; "The Shape of Water," Guillermo del Toro. Foreign Language Film: "A Fantastic Woman," Chile;"The Insult" Lebanon; "Loveless," Russia;"On Body and Soul," Hungary;"The Square" Sweden. Adapted Screenplay: "Call Me By Your Name," ''The Disaster Artist," ''Logan," Molly's Game," ''Mudbound." Original Screenplay: "The Big Sick," ''Get Out," ''Lady Bird," ''The Shape of Water," ''Three Billboards Outside Ebbing, Missouri." Animated Feature Film: "The Boss Baby," ''The Breadwinner," ''Coco"; "Ferdinand": "Loving Vincent." Production Design: "Beauty and the Beast," ''Blade Runner 2049," ''Darkest Hour," ''Dunkirk, "The Shape of Water." Cinematography: "Blade Runner 2049," ''Darkest Hour," ''Dunkirk," ''Mudbound," ''The Shape of Water." Sound Mixing: "Baby Driver," ''Blade Runner 2049," ''Dunkirk," ''The Shape of Water," ''Star Wars: The Last Jedi." Sound Editing: "Baby Driver," ''Blade Runner 2049," ''Dunkirk," ''The Shape of Water," ''Star Wars: The Last Jedi." Original Score: "Dunkirk," Hans Zimmer; "Phantom Thread," Jonny Greenwood; "The Shape of Water" Alexandre Desplat;"Star Wars: The Last Jedi," John Williams; "Three Billboards outside Ebbing, Missouri," Carter Burwell. Original Song: "Mighty River" from "Mudbound";''Mystery Of Love" from "Call Me by Your Name"; "Remember Me" from "Coco"; "Stand Up For Something" from "Marshall"; "This Is Me" from "The Greatest Showman." Documentary Feature: "Abacus: Small Enough to Jail,""Faces Places," ''Icarus," ''Last Men in Aleppo," ''Strong Island"
Documentary (short subject): "Edith+Eddie," ''Heaven Is a Traffic Jam on the 405," ''Heroin(e)," ''Knife Skills," ''Traffic Stop"
Film Editing: "Baby Driver," ''Dunkirk," ''I, Tonya," ''The Shape of Water," ''Three Billboards outside Ebbing, Missouri"
Makeup and Hairstyling: "Darkest Hour," ''Victoria & Abdul," ''Wonder." Animated Short Film: "Dear Basketball," ''Garden Party," ''Lou," ''Negative Space," ''Revolting Rhymes." Live Action Short Film: "DeKalb Elementary," ''The Eleven O'Clock," ''My Nephew Emmett," ''The Silent Child," ''Watu Wote/All of Us." Visual Effects: "Blade Runner 2049," ''Guardians of the Galaxy Vol. 2," ''Kong: Skull Island," ''Star Wars: The Last Jedi," ''War for the Planet of the Apes."